The other side of E. F. Ricketts: Don't call him "Doc"
In Cannery Row and Sweet Thursday, "Doc" is a character modeled in part on Edward Ricketts the man and Steinbeck the author. In his books Steinbeck refers to the character as "Doc" never Doc Ricketts "Doc" did not have a surname in the book. Edward was born to Charles Abbott and Alice Beverly Flanders Ricketts in Chicago, Illinois. He had a sister, Frances, and a younger brother Thayer. His early days were spent in Chicago and Mitchell, South Dakota for a year, then back to Chicago. He graduated from John Marshall High School in Chicago in 1914. He was in the Army from November 1918 to March 1919. Later that same year he started his studies in zoology at the University of Chicago under Dr. Warder Clyde Allee. On September 19Th of 1922 he married Nancy Anna Macker in Chicago. In 1923 he and Albert E. Galligher opened Pacific Biological Laboratories at 165 Fountain Avenue in Pacific Grove, California Ed and Anna had three children: Ed Jr. was born in Chicago; Nancy Jane and Cornelia Frances were born in Pacific Grove. Ricketts and Steinbeck first met in the home of Jack Calvin of Carmel in late October of 1930. The story of their meeting in a dentist's office is possibly based on fact as they both had the same dentist in Pacific Grove. In 1939 Ricketts and Jack Calvin Between Pacific Tides was published by Stanford University Press and it is still in print over seventyfive years later. We have photos of the Monterey purse-seiner Western Flyer that Ricketts and Steinbeck went to the Sea of Cortez on in 1940. And photos of other purse seiners from the Monterey fishing fleet. Ricketts's first appears as Dr. Phillips in Steinbeck's short story The Snake first published in the Monterey Beacon on June 22nd, 1935. 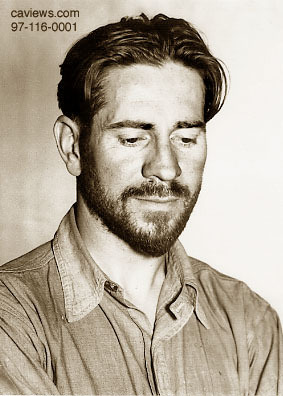 He may best known as the inspiration for the character "Doc" in John Steinbeck's Cannery Row, 1945 you can find the persona of Ed Ricketts in a number of Steinbeck's books. Hopkins Marine Station is a short walk into Pacific Grove from Pacific Biological Laboratories. Holdings: We have over 85 photos of Edward Ricketts taken by his son Ed Jr. and other photographers as well as views of the original Cannery Row Pacific Biological Laboratories and the fire that destroyed it on November 25 of 1936. Holdings: We have over 5,000 Monterey and 28,000 photos of Monterey County listed in our database. We have photos of the new wooden building built in 1937 that still stands today at 800 Cannery Row, almost next to the Monterey Bay Aquarium. Monterey Fishing industry early photo Gallery. To obtain permission to use any photographs please contact Mr. Pat Hathaway, Photo Archivist. A very special thanks to Ed Jr. and Nancy Ricketts for their friendship and help with my research and help with this page. Photos of Cannery Row by Pat Hathaway from the 1960 to today.